Discover the freedom of arranging your living room without being limited by your audio/video devices. 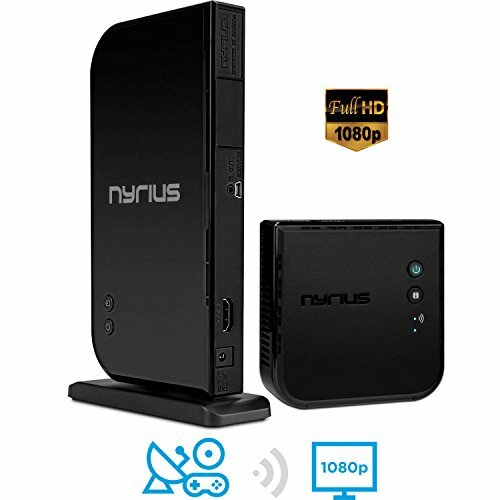 Wirelessly transmit the signal from your Blu-ray/DVD player, digital cable box, satellite receiver, laptop, or gaming console up to 100ft away in high definition with 3D compatibility to your HDTV or HD projector. Now you can easily stream uncompressed high definition audio and video without running messy cables. There is no reduction in picture quality allowing you to experience full 1080p resolution. The ARIES Home will allow you to watch any device with HDMI connections on any HDTV wirelessly. The Aries Home allows for wireless transmission of true 1080p HD quality up to 100ft. This system is capable of transmitting uncompressed video and surround sound audio with zero latency through walls, floors, and ceilings without interfering with other common wireless devices such as WiFi or Bluetooth. The infrared extender makes for a convenient solution for changing channels on your cable box. The included extender allows you to control your media device from any area of the home. Change channels, pause your movie, adjust volume - any function available will work using the remote extender. The ARIES Home is ready to go right out of the box allowing you to quickly set up the system and begin benefitting from wireless HDMI capability. Just plug the transmitter into your devices HDMI port and the receiver into your HDTV and you're immediately connected. Eliminate the inconvenience of installing messy cables. No software or WiFi connection required. The transmitter has 1x HDMI input and the receiver has 1x HDMI output. View More In Receivers & Amplifiers. If you have any questions about this product by Nyrius, contact us by completing and submitting the form below. If you are looking for a specif part number, please include it with your message.